The mental picture I had back then was one of mother and daughter, lovingly curled up together for a bedtime story. Mother (me – but played by Nicole Kidman in my head) is softly reading from the pages, whilst daughter gazes up at me attentively, engrossed and hanging on every colourful word that spills from my lips. She will adore the pictures my words paint. She will be lost in wonder at magical worlds and mysteries and monsters. She will revel in fairies and frog princesses, and she will be agog at Gruffalos and dancing giraffes. It was a part of parenting I thought about a lot, and looked forward to the most. And yes – a few years on and I am very proud to say: Grace loves books. Result. However . . (you just knew that was coming, didn’t you?) I hadn’t planned on what a strange little creature my Gibby would be, and that although books are a firm favourite – even the most ardent literary fan can be distracted. 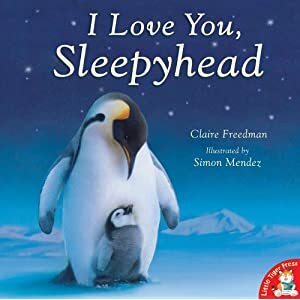 Our current bedtime book is “I Love You Sleepyhead” written by Claire Freedman and illustrated by Simon Mendez. It’s gorgeous. It’s about different baby animals around the world snuggling down to sleep while their mummies watch over them. “Wrapped up in love, little bear feels so snug, cuddled goodnight in a big Mummy hug. Drifting to sleep he sinks into her fur, warm in the soft snow, snuggled with her.” All together now . . . aahhhhhhhhhhh. Scene: Nursery. Nicole Mummy and Grace are curled up together in bed for story time. I begin to read . . .
And so it goes on. Not quite the scenario I had in mind but I guess that sums up parenthood in general, doesn’t it? Whatever you think it’s going to be – take that thought: shake it about, turn it upside down, back to front, smash it to pieces, put it back together and you’re still nowhere near. Oh this made me laugh so much! Funniest post I’ve read in a long time and BZ is very much at the same stage I think. At least Grace lets you attempt to read to her. I get the book snatched off me with a ‘night night mummy’ said in a ‘bugger off now then – gonna read it myself!’ tone. Hehe, know exactly the kind of scenario you are talking about! All my stories are also interupted by me having to say to the toddler: “get down off there!” “don’t pull on the curtains”, “don’t hit your sister”, “don’t jump on the bed” etc etc. Read this from your recent link – Laughed out loud!! brilliant.. probably shouldn’t be embarrassing my 17 year old but meh! He used to love books (still does actually) and one of his faves at about the age of 4 was called What People Do – a lovely, shiny, busy flip book – he however said it as What Peepy Do – something that stuck! hahhaa – in our house,when we talk about others careers – we all refer as peepys and what they do!